News from LMCU: Sign up for LMCU eStatements for a shot at a free Apple iPad Air 2! 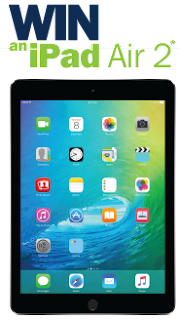 Sign up for LMCU eStatements for a shot at a free Apple iPad Air 2! Are you still doing paper account statements? Really? Save some trees and go digital with LMCU’s account eStatements for your chance to win a free Apple iPad Air 2! All current LMCU members who have signed up for eStatements are automatically registered to win. If you still get traditional paper statements for your LMCU banking and mortgage accounts, you can make the switch to eStatements by logging into online banking, clicking on the Other Services tab and clicking on eStatements/eNotices sign up link, or by visiting any branch location. Entry deadline is September 15, 2016. Sign up today! *For more information and complete contest rules, please visit lmcu.org/estatements or visit any branch.